Mount Everest is so famous for being so high that you've probably heard of it before. It has been known the world over since the early 1950s when Sir Edmund Hillary and Tenzig Norgay first climbed to its awesome summit. Hillary surveyed Everest at the time and determined that it was 29,000 ft/8840m high - a figure amazingly close to the current reading of 29,035 ft/8850m, which was confirmed using radar and global positioning satellite (GPS) technology. Using state-of-the-art technology Professor Brad Washburn of the Boston Museum of Science, the world's foremost mountain cartographer, and his team have calculated that earth's highest elevation is actually 7 feet higher than the previous record. That makes the official height 29,035 ft/8850m. Thanks to some engineering whizzes at the Massachusetts Institute of Technology who developed really light, high-tech gear, the work of Washburn was made easier because he was able to hand carry a radar device to the top of Everest where it could be positioned to measure the actual height of the mountain - underneath all that snow. GPS technology was also deployed near the summit, which uses satellite signal relays to take readings from the top of Everest. After months of crunching numbers Washburn's team arrived at the new, official world-record elevation. They've also determined that the Himalayan Mountains are still growing higher, at a rate of about 2.4 in/6.1cm per year. That's twice as fast as previously thought. A growth rate of 2.4 in/6.1cm per year doesn't sound like very much. But, if you think about it, that means in the last 26,000 years the Himalayans have risen almost a mile into the upper reaches of the earth's atmosphere! Take a virtual climb to the top and see an incredible, panoramic view from the summit of Mount Everest! When Hillary and Norgay climbed to the top of Everest they wore oxygen tanks. Because Everest is so high it juts into the upper reaches of the earth's atmosphere, where there are much lower concentrations of oxygen than at sea level. What that means to folks trekking up the side of Everest is that their bodies get less oxygen from each breath they breathe while climbing. But their brains and muscles require the same amount of oxygen to perform as they would at sea level. That makes it especially tough to climb Everest. Try to imagine what it feels like to climb up a mountain with very little oxygen in your body - you get dizzy, your nose, fingers and feet get numb and tingly, your heart thunders in your chest trying furiously to keep up with the muscles' demand for oxygen. You feel sleepy, confused, downright stupid as your brain struggles to function on limited oxygen. Every step you take is extremely slow and plodding, requiring every ounce of will you have. Hillary and Norgay had extra oxygen to help them make the trip, but there have been a few people who have made the trip since who did it without the aid of oxygen - taking one step about every five minutes! Approximately 6,000 climbers have attempted the summit of Everest, but only 2,249 have made it. Over 200 people have died trying and of those, at least 120 bodies are still missing on the mountain. 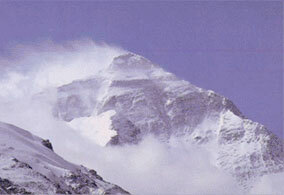 Mount Everest is just one of over 30 peaks in the Himalayas that are over 24,000 ft/7315m high. Himalaya is a Sanskrit word meaning, "abode of snow", which is so true. The name of the mountain in Nepal is Sagarmatha, which means "goddess of the sky". The snowfields which dominate many of the peaks in the Himalayas are permanent. Yes, they never melt (not even in the summer). That means there are glaciers in the Himalayas - lots of them. Mount Everest is permanently covered in a layer of ice, topped with snow. The "top" of the mountain at which the elevation was measured can vary as much as twenty feet or more, depending on how much snow has fallen on its peak. Scientists believe that the actual tip of the rock lies tens of feet below the ice and snow on its summit. There are current plans to use ground penetrating radar to get a reading of the actual height of the mountain beneath all that snow. Although the Himalayan Range is only 1,550 miles/2480km long, the average height of all the major peaks in the Himalayas easily makes it the highest mountain range on land. Mountains aren't just big piles of dirt, they're made of solid rock. Believe it or not, the rocks that make up the Himalayan mountains used to be an ancient sea floor. Over millions of years, rivers washed rocks and soil from existing mountains on the Indian subcontinent and nearby Asia into a shallow sea where the sediment was deposited on the floor. Layer upon layer of sediment built up over millions of years until the pressure and weight of the overlying sediment caused the stuff way down deep to turn into rock. Then about 40 million years ago, in a process called "uplifting", the sea floor began to be forced upward forming mountains. The Himalayan Mountains are forming where two tectonic plates are crashing into each other, known as a convergent boundary. What caused the sea floor to be pushed up toward the sky was the result of the action of plate tectonics. Plate tectonics has only been around for about 30 years and is a theory developed by scientists from many different disciplines working together. The earth's tectonic plates are continually moving, even today, but the speeds at which they move are REALLY SLOW. In human terms the movement can't even be seen, but it can be felt occasionally when we have earthquakes. Earthquakes happen when plate margins (edges) move past, or bump into each other. In the case of the Himalayan mountains, the continent of India is part of a plate that "crashed" into southwest Asia (read about converging plate boundaries), but it didn't stop when it hit. It continued to push northward, crushing and rumpling the earth's crust, resulting in the mountains we see today. If you look at a map of the Himalayas, you can see that the mountains look kind of like a rumpled blanket. India is still pushing northward today, raising the Himalayas even higher! Need more earth science information? Read about the geologic history of earth. Scientists know this because they've been measuring the increasing height of the mountains. There have also been a lot of earthquakes recorded down deep in the mountains, which indicates continuing movement. The Himalayas are growing, but only about 2 inches a year. That's not very much in human terms, but imagine how much that would be over millions of years! You may be thinking, "That would have been kinda cool to be here on earth 40 million years ago to be able to watch the Himalayas forming". You would have been really bored, though. The movement that took many millions of years to form the mountain range is still taking place today, and I doubt you would stake out a camp at the foot of the mountains just to watch them grow. You'd be waiting a LONG TIME.